Home / Giveaways / Crochet Week Hook Set Giveaway! 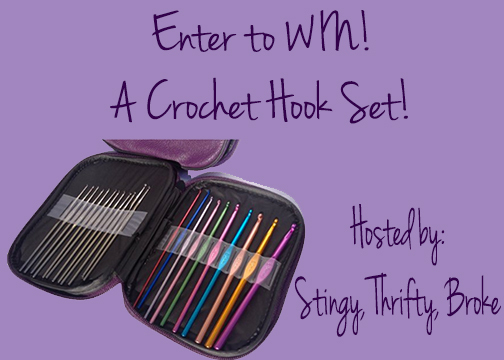 Crochet Week Hook Set Giveaway! It’s National Crochet Week! Exciting right? To help celebrate, Hot Knit Cafe decided to help us do a giveaway for some awesome crochet hooks! I’m a fan of these crochet hooks because A) you get a large set and B) you get a case to hold them. When I first started crocheting, I lost my hooks all the time because I would just set them down somewhere and then forgot. Whoops. In addition to this giveaway, Hot Knit Cafe is hosting an extra giveaway! That gives you TWO chances to win! Disclaimer: The participating bloggers were not compensated for this post. No purchase is necessary to enter. One entrant per household, per IP address. All entries will be verified. Void where prohibited by law. Winner will be contacted by email; Please add ninamcclain93@gmail.com to your whitelist. Hot Knit Cafe will be responsible for prize delivery to the winner. This giveaway is in no way administered, sponsored, endorsed by, or associated with Facebook and/or Twitter, Google, Pinterest, or any other social media platform. My daughter crochet and I would love to surprise her with these! I want to win because I’m just ‘re-learning how to crochet and I can’t find three-quarters of my old books. It’s driving me nuts!